This post was co-authored by Twirlbound's technical director Marc Peyré and general programmer Martin Stuurwold. On the island of Albamare, every organism is alive. We are working with a digital ecology in which dynamic agents respond as if in a simulation, rather than with static behavior – they have needs, react to each other and make decisions of their own. In this project highlight, we’d like to dive a bit deeper into the systems behind this, the way we are building this (being the small team we are) and more. These are the species and organisms of Pine! In Pine, we work with genetic algorithms to give a true, technical spin to the theme of evolution. Each organism has a set of genes. Their decision-making, visual traits and behavior is based on these genes. Within a species, these genes mutate across generations, by picking the best genes from a shared gene pool. While keeping variety, this means that the average of genes specializes more and more towards a specific player. At the moment, we have built 4 fully-fledged species that we are testing and iterating on. We plan to make 4 more, eventually filling the game world with 8 different species. Next to these, about a dozen critters fill up the world, serving as food and as ecological balances. However, it wouldn’t make sense if the Alpafant of the forests looks the same as the one in the dunes – an example of where that genetic variety would come in handy. As you can see in this gif, we are letting code decide on specific details of how any organism looks. They have different colors and outfits, and some are more buff than others. Even their individual personalities are reflected in the way they are posing (arched, upright, etc.). This way, you can naturally observe the traits of a certain species. Their strength, health and specific behavior is hinted towards using the amendments and genetic algorithms we use through our systems – if a species is wearing more armor, it’ll take you longer to beat them. If they’re using large, stone clubs, they’re probably going to be a bit stronger than their wooden-club-wearing relatives. Instead of species evolving superbly in all areas, they focus on areas the player is bad against. This means you get a personalized AI against you! That specialization is mostly noticeable in combat. Although we’re still experimenting with some unique combat additions, this Friday we’re sharing a technical look into the species’ state machines and how they ‘think’ for themselves in conflicts. Through genetic algorithms, this process of specialization becomes stronger as you play. The more data the game has, the more we can make the AI grow to something personalized. When we first put two species together in a scene, they started fighting – a good example of systemic gameplay! When we dropped the player in there, they started shifting their attention between the other species and the player, based on friendships and the hierarchy. This created strong scenarios that inspired us to focus on that more. By making each species share the same core structure, we can polish their behavior, the ally-and-enemies system and cooperation to perfection. The core idea of generalization and systemic design is a very strong factor in the world we are creating. Although lots of our ideas might sound ambitious, testing and iterating becomes much more doable through these systemic approaches. So far it has been worth looking at the underlying core, rather than at situations – if the base is strong, amazing scenarios can pop up. But species aren’t fighting all day. In Pine, we focus on the basic needs of hunger, shelter and territory. Our world is scattered with points of interest (POI), which indicate important places the organisms visit. These are often places where food can be gathered, but also strategic points for lookouts or defense. Of course, this domestic behavior is interrupted if something more interesting happens nearby. Species live in villages that are placed procedurally. Based on how well a species is doing in the hierarchy, their population and village size will increase or decrease. The number of organisms you’ll see from a certain species is based on how they’re doing against each other, and how you interact with them. Pine, being medium-sized, won’t focus on an 80-hour storyline, nor on a 100km2 island to play around in. Instead, we’ve discovered that our strongest situations have come out of species interactions, by assuming them to be like players. The individual variety we’re aiming for in the species also works well – some are more aggressive, some more defensive, because they might have a different nature. Just like humans. We are treating each character, (the player and the species they may encounter) as Organisms that contain multiple components that give them their appearance and behavior. An important part of this is the state machine system, which is located inside the brain component of each Organism. Each state has the functions OnEnter(), Process(), and OnExit(). 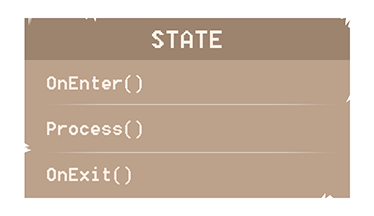 The OnEnter() and OnExit()functions are called when the state machine transitions to and from this state, respectively. While a state is entered, it calls the Process() function each frame. 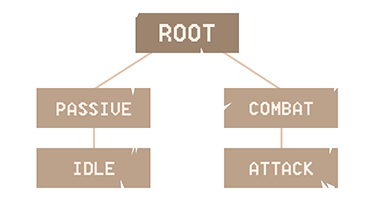 Idle --EXIT-> Passive --EXIT-> Root --ENTER-> Combat --ENTER-> Attack. In Pine, as a player you are allowed to attack from many states, for example from multiple Idle, Movement, and Attack states. Without our system of generating the Animator Controller and transitioning in code, we would need to manually set up each possible transition from every state to every other state. This would make it very viable for us to forget to set up a transition in the Animator Controller, causing the two state machines to once again fall out of sync when that transition is supposed to occur. As a bonus to us treating the player the same as any other Organism, we can easily swap out the processing logic inside each state to specific AI/player-controlled versions. For example, in a player-controlled version of a state we would poll for input to decide where to transition next, while in an AI-controlled version of the same state we could then let the AI decide where to transition next. 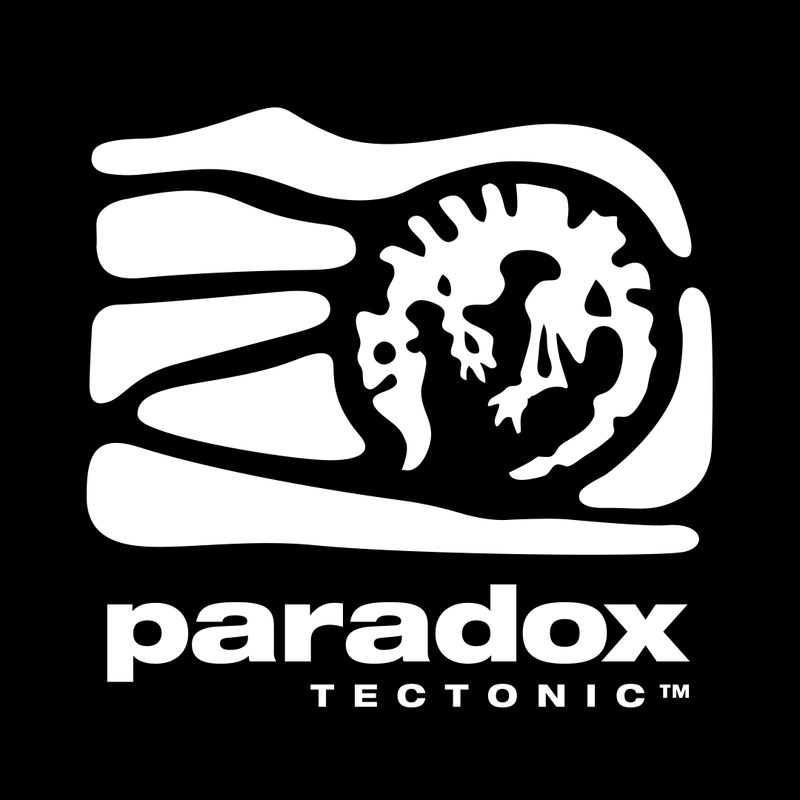 This allows us to swap between player-controlled and AI-controlled Organisms at runtime. With such a systemic approach, a small team like ours is able to constantly iterate on the core technology, rather than on instances of mechanics and situations. We attempt to creating a living world by making the rules, rather than individual inhabitants. By making sure as much as possible is automized and generalized, you can create new possibilities and a lot more content than you might be when crafting everything by hand. Pine is currently on Kickstarter, where it's currently over €75.000! Check it out. More on Pine is on our blog, Twitter, Facebook and Subreddit.